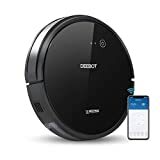 Black Friday just came early for the ECOVACS DEEBOT 601 Robot Vacuum Cleaner, which has a full retail price of $400. It’s worth that asking price because of its strong suction, app controls, two different cleaning modes, and a unique S-shaped movement pattern that ensures every inch of ground is covered. It’s on sale for just $200 right now, but the coupon code 65GC48WP gives you an even bigger discount, slashing the price all the way down to $179.98!